Deconovo decorative throw pillow cover magnifies the overall look and feel of your home. These pillowcases are made of polyester, feature a tufted design for increased comfort and a more tailored look. Just place them on your couches or sofas for added comfort and style. These cushion covers are richly colored. Designed in solid colors, these cushion covers suit both the minimalist tendencies of modern decors and the sophistication of traditional ones. Deconovo pillow cushion cover is sumptuous and will help add colour to your living room. Hidden zipper closure for easy care with a seamless look. The pillow/cushion cover is made of 100% high quality polyester. Package includes 4 pieces with 18 Inch wide x 18 Inch length (45cm x 45cm). SOLD WHITOUT INSERT. You can print or embroider whatever you like in these solid color cushion covers. They are ideal pillow covers for personalization. This pillow case covers with invisible zipper improves the apperance and provides easy insertion and removal. 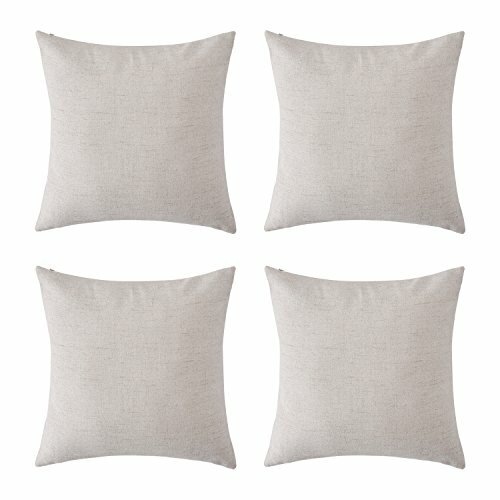 Deconovo decorative faux linen cushion cover is the perfect cushion cover for sofa, couch, chair, bed, school, travel and naps. If you have any questions about this product by Deconovo, contact us by completing and submitting the form below. If you are looking for a specif part number, please include it with your message.